All cannabis trimming scissors need to be cleaned regularly to make sure the blades remain in good condition and to keep the bud-trimming process smooth and speedy. 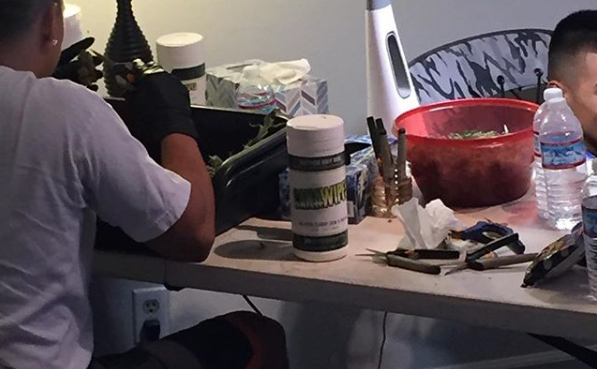 Whether selling or growing for yourself, working with clean cannabis tools is essential. If you don’t clean sticky scissors, you can end up with poor quality flower to sell and/or enjoy. And don’t forget that different strains and different harvests render buds that produce different levels of resin, which means that cleaning trimming scissors can be more or less challenging depending on the flower. But regardless of the changes brought about by each individual harvest, the best way to clean trimming scissors will always incorporate three basic steps: scrape, rub, and oil. The first thing that will happen after you’ve trimmed a few buds, is that resin, plant matter, and trichomes will start to build up on your scissor blades, making it more and more difficult to cut. It’s at this point that you need to take a break from trimming and start scraping. Make sure that the tool you choose, perhaps a knife or a scalpel, is very sharp. Scrape the accumulated resin and flower matter – or “scissor hash”, as it’s sometimes referred to – off of the scissor blades and into a small bowl. To make this first stage of cleaning trim scissors even more effective, you can run the knife or scalpel you’re using under a scolding hot tap each time before you scrape. The hotter you can make your tool, the better and closer the scrape will be. The great thing about scraping your trimming scissors is that you get to sample the taste of your new harvest there and then, using the resin and plant matter that you remove from your trimming scissors. While scraping is fairly effective at removing most of the resin and plant matter that can accumulate on scissor blades when trimming, it won’t solve the stickiness, which is why you also have to rub your trimming scissors with some kind of cleaning solution. Options include either rubbing alcohol, a homemade citrus remover, white vinegar or simply using Can-A-Wipes. If you choose to work with rubbing alcohol, leave your scissors in the alcohol to soak for a few minutes and then rub down the blades with a clean piece of material or cloth. The problem with this solution is that you will need to have a number of rotating scissors that you use during your trimming. If you opt for white vinegar, soak a clean cloth in the vinegar first and then rub the blades until the sticky feeling goes away. If you decide to create a homemade citrus remover, you’ll need to combine equal parts of baking soda and coconut oil, and then add a natural citrus oil to the mix. Massage the mixture into your scissor blades using a soft cloth. Finally, once all resin, plant matter, and stickiness has been removed from your trimming blades, you should finish the job by oiling the blades of your trimming scissors. Oil will help to keep the scissors in excellent working condition. In particular, by regularly oiling the pivot on your blades, you’ll be able to cut more easily. Just be careful to remove all signs of oil from your trimming scissors before you go back to trimming your buds, otherwise the quality of your flower will be compromised. If, having read the above advice, you’d rather invest in a quick and effective alternative to scraping, rubbing, and oiling every time you trim, then you should give canawipes a try. Can-A-Wipes offer a much simpler and less cumbersome solution to traditional trimming scissors care. All it takes is just one swish of a canawipe to remove all traces of resin and plant matter from your scissors in an instant. And if you don’t want to miss out on the scissor hash, just scrape before you wipe.